This retreat center offers daily campus tours that include light hikes to many beautiful bluff vistas or waterfalls, rejuvenating time spent in Adiyogi: Abode of Yoga, an energized meditation space, and a visit inside the largest yoga and meditation hall in the western hemisphere. Free guided meditation sessions are available each day, offering guests simple and powerful meditation practices. See the daily schedule for visitors here. Overnight stays include the option of private studio accommodations, delicious vegetarian buffet meals, and an introductory yoga session of the visitor’s choice, such as the ‘yoga of sound’, yoga for strengthening the joints, and yoga for purifying life energies. This retreat center also offers myriad opportunities for hiking and mountain biking on forested trails winding throughout nearly 1400 acres. 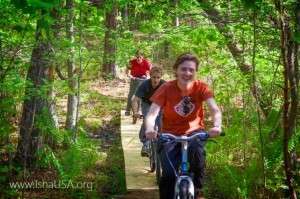 The center’s five miles of mountain biking trails have been professionally classified from beginner to intermediate skill levels, with steep climbs, water features, and tight switchbacks livening up the more challenging routes. 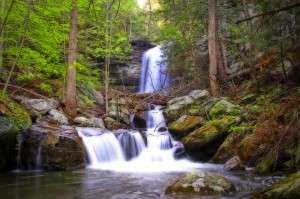 The trails are part of an expanding network of over 15 miles of hiking and biking trails featuring beautiful waterfalls, a meandering spring-fed creek, and breathtaking bluff overlooks. NOTE: Guided hikes available on the weekend. Self-guided hiking available daily for groups of two or more people. The Isha center is open year-round, offering a full range of yoga programs from beginner level to advanced. Classes for beginners include hatha yoga classes such as Surya Kriya, Yogasanas and Angamardana. The introductory level meditation program Inner Engineering is offered both online and in live formats in 35 cities across the USA and Canada. The practice portion of this program offers a kriya, Shambhavi Mahamudra, which is available here at the Isha Institute the first weekend of each month. 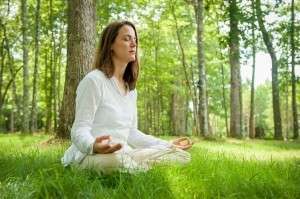 At the Abode of Yoga, all visitors can take part in simple yogic processes to enhance all aspects of their life, or simply sit and meditate in the powerful and serene space. This meditative space is established as a tribute to the Adi Yogi, the world’s first yogi, who offered the yogic sciences to the world over 15,000 years ago. A visually striking 30,000 sq ft space, the Abode is a unique two-level structure housing a 21-foot statue depicting the Adi Yogi alongside an energized copper form (linga) that visitors can connect with. Exquisite paintings depicting the significant aspects of Adi Yogi’s life adorn the walls of the Abode. Open year-round from 8 AM – 8 PM to all visitors. Browse Isha Shoppe, which includes Isha’s own collection of naturally-made wares. Isha Shoppe features Isha Craft hand-crafted decorative pieces that include paintings, pottery, unique brass and copper metal art, and elegant imported granite carvings. All proceeds from Isha Craft benefit Isha’s humanitarian initiatives. Free Yoga Day offers family-friendly yoga sessions will be offered throughout the day. These yoga sessions are based in classical yoga and are suitable for everyone, addressing every aspect of a person, from body and mind, to emotions and energy. No physical agility or previous yoga experience is needed to attend these sessions. One can choose the session based on their interest. Each year, in tandem with the United Nations’ International Day of Peace, Isha Institute of Inner-sciences celebrates both World Peace Day and Isha Fest. World Peace Day is dedicated to empowering peaceful possibilities within ourselves and our world through thought-provoking discussion, creative expression, celebration, and meditation in the idyllic natural setting of Isha’s Upper Cumberland retreat center. World Peace Day is both a celebration of human potential and an inspiration for every human being to transform one’s life into a blissful experience. Isha Fest marks the inception of Isha Foundation and the humanitarian efforts of founder, Sadhguru Vasudev, a yogi,visionary, and preeminent global voice for cultivating a more peaceful and joyful humanity.